Easy 12 today. Benjamin ran 3, Jenny 4, Joseph and Jacob 4, Julia 4, I think. William 2, Stephen 1, Matthew 0.25. Benjamin was very sore but could run a little bit. We had an unexpected visitor - Steve Ashbaker just showed up, it was nice to see him. I ran 6 miles with him. Usual 12. Kids ran their usual distances, except for Jenny who was not feeling quite as well and did only 3. Benjamin did 4 in the morning, will do another 3.8 from BYU in the evening. His legs are still sore from the half. With Benjamin, Joseph, and Jacob. Jacob had some issues with his back. Hopefully just growth pains. 12 total today. Kids ran their usual distances except Benjamin who did 6+3.8. With Joseph and Jacob from the car shop. Benjamin started feeling a bit more nimble today, so we decided we may just as well sneak in a shake-the-cobwebs 800 meter time trial. He ran about what I expected. I said before the start that I was expecting a good first lap, but then some fading in the second lap. He ran 29.6,31.5,33.5,34.0 - 2:08.6. Now we have a starting point to work on his 800 speed. I did the warm-up, the strides, the third 200, and the cool down. Then a mile with Jenny. Then Benjamin ran to BYU. Joseph, Jacob, Julia, and I joined him for the first 1.5, then we headed to the car shop to pick up the van, while he turned off towards BYU. 3 more miles later alone after I got home. Kids ran their usual distances today. Benjamin's time trial. I ran the diagonals, and the third 200. Considered finishing the lap, but then I was worried I would get dropped if he did a 31 or faster. Next time I should just not worry and time him as he finishes from behind if I have to - plus he times himself as well. To the car shop with Julia, Joseph, and Jacob. Benjamin joined us for the first 1.5 then went his way to BYU. 12 for me today, Benjamin did 6+3.8, otherwise kids ran usual distances. I did a small workout with Benjamin - 3x0.25, 2 down the canyon (72.1,70.2), and one uphill near the house (76.8). Benjamin did 300s with me, then kicked. Then I ran 4 with Joseph and Jacob, we did 2x200, one down, one up. I stayed with Jacob, he did 35.8, 41.9 - Joseph was about half a second ahead on the first, and 2 or so ahead on the second. Total of 15 for me. Benjamin had a programming competition in the AM, so he did 8+6. Other kids ran their usual distances. With Joseph, Jacob, and Julia. Did 5x0.25 with Benjamin, 4 down the canyon, 1 uphill by the house in the middle of 8 miles. Then 2x200 with Joseph, Jacob, and Jenny in the middle of 4. Joseph was a bit ahead, I stayed with Jenny and Jacob. Benjamin did 8+3.8, usual distances for everybody. With Jenny, Joseph, and Jacob. Julia ran the first mile with us. Today, Benjamin, Joseph, Jacob, and I did a 200 time trial. The day was not the best for it, it was cold and the track was wet. Sometimes you can go fast on a wet track, but today was not one of those days - I think maybe the little ice particles is what made the difference. We noticed something was funny during the strides I could not go faster than 16.4, and Benjamin was stuck at 14.4. Things got a little better in the 200. Benjamin was able to run 27.6, I ran 32.3 in my second attempt - the first one was 32.8. I also paced Joseph to a 34.9, and Jacob to 36.8. They both should have been much faster than that as well. Then we ran some extra distance. Kids ran their usual distances otherwise. Benjamin's 200 - I ran the diagonal to time him. My time trial - first attempt. My second attempt, Benjamin ran it with me. It went better. Extra distance with Benjamin,Joseph and Jacob. With Benjamin. I think we had Jenny with us as well. With Stephen, William and Julia. Maybe Jenny also. Usual run. Kids ran their usual distances. With Benjamin. Jenny started with us, then turned around at 2 miles. Benjamin's hamstrings were still sore today from the 200 time trial on Tuesday, plus he was going to race Saturday, so I had him just run 8 in the AM, and picked him up from school. Otherwise kids ran their usual distances. With Joseph, Jacob, Julia, and Jenny. Jenny turned around at 1.5 and then ran home to finish 2 miles with William and Stephen. Kids were tapering today for the cross-country championship tomorrow. Otherwise a usual day. With Jacob, Jenny, and Julia to the bank and back. With Stephen, William, and Joseph. William (7 years old) 9:31 (third place) - McKay Wells won in 8:20, William got outkicked by another kids in the last 100 meters who ran 9:27. Stephen - 13:09, 6th place - he got lost on the course, not sure how much time he lost. But he is only 5, so I was not expecting him to be competitive against 8 year olds. They both took a wrong turn and lost about 10 seconds after about the first quarter. I was a bit concerned about Joseph because he complained about a cold yesterday morning, but he seemed to be OK.
Julia took second with 19:06. That was a breakthrough run for her. Jenny won with 23:33. Good time for her for cross-country. Benjamin got 4th with 16:59. Ahead of hims Riley 16:15, Jake (back in racing) 16:20, and John Coyle 16:55 (I think). I ran 18:43 winning the masters ($30). Mark struggled today - was with me for the first mile or so, then fell apart badly. Benjamin was actually ahead of John until the last 600 meters. There was also a high school runner in the heat, but not in the open race because he was in the 17-18 division. Not sure who he was. He took out hard, was ahead of Riley and Jake for some time. Benjamin caught up to him somewhere between 2 and 3 K, they went back and forth for a while, then Benjamin dropped him and ended up beating him by 10 seconds. John started out very conservatively, but then closed very strong passing first the high school runner, and then Benjamin. Afterwards Benjamin and I added 8 miles. Jenny's race. I ran around cheering, probably a mile. A cold day today. We all ran our usual distances. With Joseph, Jacob, and Julia. Jenny ran the first 1.5, then turned around and finished her run with William and Stephen. We got some snow by this point, so we had to slow down a lot. Usual day, except Benjamin and I did 3x200 - we managed to find some dry spots in the canyon where this was possible. My watch got discharged, so I did not bring it and had to guess my splits - which I think were around 33 for the first one, and around 32 for the last two. Benjamin got 30.3, 29.6, 27.4. Usual run today. Kids ran their usual distances. Tempo run with Benjamin. He paced me through 2 miles in 10:48 (5:23,5:25). Otherwise a usual run for all of us. With Joseph, Jacob, Jenny, and Julia. I think Julia turned around early today and ran with the Stephen and William. Usual run, except Stephen did extra duty running another mile after failing to reach the fruit snack standard in the first half-hearted attempt (9:41). The second time he was focused and it went better - 8:54. Total of 16. Did 13 with Benjamin. We did a workout. He ran 2 miles down the canyon in 9:48(4:55,4:53). His target was 5:00. I ran the first 0.5 with him in 2:28, then settled into a tempo pace and finished 2 miles in 11:01. Benjamin, Jenny, and Joseph ran 5, Julia did 4, I think. Otherwise usual distances. With Joseph, Jacob, Jenny, and Julia. I think it was Jenny's turn to run with William and Stephen today, so she turned around early. A little bit less today to be fresh for the Thanksgiving race. Benjamin did 8, Jenny, Julia, Joseph, and Jacob 3, William 2, Stephen 1, Matthew 200 meters, and Mary 100 meters. Mary improved her time from 1:57 to 1:39. Ran back to meet Jenny, Joseph, Jacob, and William. Did a pickup for a little over 300 meters. Turned around when I saw them and finished with them, then added 0.5 pickup in 2:52 - one quarter out, one back on the little boy course. Benjamin did 6, Jenny, Julia, Joseph, and Jacob 2, William and Stephen 1, Matthew 200 meters. I did 10. Benjamin and I did a pickup for 0.5 in 2:30 on the little boy course coming back to the house, splits 72/78. With Benjamin, Jenny, Julia, Joseph, and Jacob. Today our family ran in the Earn Your Turkey race in Orem. The goal was to maximize the turkey count. We got a total of 9 turkeys - Benjamin, myself, Jenny, Joseph, Jacob, William, and Matthew by winning/placing, Mary as the youngest participant, and all of us together as the largest immediate family - we had 11 participants. Conditions were cold and windy today, everybody's times were slower than they should have been, but that is OK, during the warmup I realized that we would likely be racing for turkeys rather than PRs when I felt the wind. Benjamin - 20:54, 2nd overall(turkey), beat by Rex Shields (1:04 halfer) who ran 20:25. 3rd place (21:02) was Jaydn Asay, a UVU runner, 15:20 5000 PR this April on the track in Azusa,CA the LA area at the Bryan Clay Invitational. That might actually be a good meet for Benjamin to run next year for a chance to break 15:00.
myself - 23:16, 14th overall, first in 40-44 age division (turkey). Not sure what to think of it. I ran around 5:40 average for the first 2 miles (using my own landmarks I measured out last year), and then the wind was just too much. Plus around 2.7 the wind blew off my Croc and I lost 5 or so seconds putting it back on and getting back into the rhythm. Joseph - 26:49, 1st in 11 and under division (turkey). We put him in the 4 mile race to maximize our turkey count, as we suspected he would very likely win it, while this would allow Jacob to win the 9-10 age division in the mile. The plan worked. Jenny - 28:07, 7th overall, 1st in 15-18 division (turkey). A breakthrough race for her. Julia 29:44, 3rd in 12-14. Last year Jenny won that division with only 30:39 and the conditions were ideal. I thought for sure with a minute faster on a day like this she would win, but there were some fast girls. 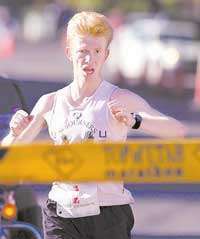 Sidny Gardner won with 28:39. Sarah 33:44, 9th in 35-39 division. We were hoping for sub-32:00, but still I think it was a good performance for the weather. Jacob 6:06, 1st in 9-10 (turkey, beating 11-12 division as well). Probably would have been 5:50 if it was not for the wind. He was with the 11-12 division winner at around half way mark, but ended up 19 seconds ahead at the finish. William - 3:27, 1st in 7-8 division (turkey). Was by far not the first out of the gate, but moved into first place among boys by half way. The first girl was ahead of him still, but he passed her with about 150 to go. I do not know what happened to her as he ended up 19 seconds ahead. Stephen - 4:16, 2nd in 5-6 (pie). Lost the turkey by 0.2 to his arch-rival Luke Baird. Stephen somehow has had bad luck so far - the only kid in our family to have never won his age division at this race by the age of 5, yet he holds our family records in the 800 and the mile for the 4 and under division. Part of the problem is that he naturally is quite laid back and not exceptionally competitive. This may prove an advantage later on as this will help avoid overtraining and injuries. Matthew 30.8, 1st in 0-2 division (turkey). Second time in our family history that we had somebody win the diaper dash. Jacob won it in 2008. This division is difficult to win as talent, natural kid's temperament, and the pure luck of being almost 3 in November trump any kind of preparation. We lucked out this time. Matthew is turning 3 in December, is perfectly obedient and enthusiastic about running, and has some natural talent, I think. And he was also well prepared. This was his third time in the diaper dash. The only other child to have done in three times in our family is Joseph. Mary, 1:22, 3rd in 0-2, youngest participant award (14 months old), turkey. Stellar performance for that age, much faster than I expected - especially given the conditions. No temper tantrums, she just ran. Waited for the chip to be removed, found Benjamin, then we ran back. He turned around when he saw Joseph, I ran back to Sarah and finished with her. 100 meter 0-2 age division dash. I ran with Matthew, Sarah ran with Mary. The rest of the kids went some to Matthew and others to Mary. William and Stephen's race. I paced William, Benjamin paced Stephen. Jacob's race. I paced him. Benjamin acted as the official rabbit until Jacob moved into the first place overall, then he paced the 12 year old winner. A little bit of extra jogging. Got some wind today. Benjamin did 10, Jenny 3, Julia 2, Joseph and Jacob 4, William 2, Stephen 1, Matthew 200 meters. Benjamin and I did 2 pickups for 0.25, one on the little boy course on a slight downhill, but with two turns, the other uphill on the big boy course. With Benjamin, Joseph, and Jacob. With Benjamin. We did a pickup. With Benjamin - pickup on the uphill. Total of 15 - all with Benjamin. Joseph, Jacob, and Julia did 4, Jenny 5, William 2, Stephen 1, Matthew 200 meters. With Benjamin, Julia, Joseph, and Jacob. Day of rest. Went to church. Heard good talks on work and service in the Sacrament meeting. Jacob's teacher was out of town, so I taught his class in Primary afterwards. The lesson was about how Paul escaped beating by telling the authorities he was a Roman citizen, and then testified to king Agrippa, how responded with "Almost thou persuadest me to be a Christian"
Lots of snow today, Benjamin and I barely broke 8:30 average. Usual runs for everybody. Benjamin was going to have a busy week at school, so he is running singles this week, only 8 miles a day. With Joseph, Jacob, Jenny, and Julia. Jenny turned around after 1.5 so she could run with William and Stephen.